Big Horn Getaway: Buffalo, Wyoming Escape to the historic Powder River Basin city and revel in its rich history. 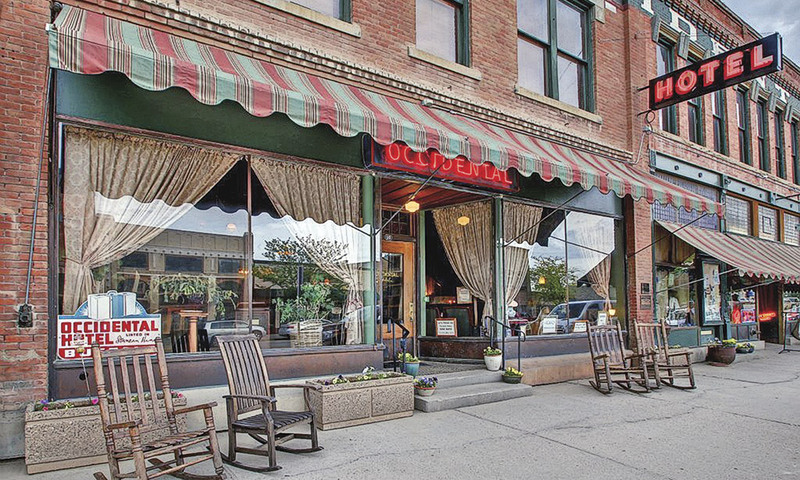 Nestled in the foothills of the Bighorn Mountains in the Powder River Basin of north central Wyoming, the city of Buffalo has a vibrant historic district along Main Street, including the fully restored Occidental Hotel and its Busy Bee Café, the Virginian Restaurant and Occidental Saloon. Few towns are more thoroughly Western than Buffalo, Wyoming, and isn’t the name perfect? It conjures images of the great beasts roaming the plains, grizzled hunters in pursuit, Indians relying on them for their very lives. Well, the buffaloes probably have nothing to do with it. The most commonly told naming story says that early residents tossed their suggestions into a hat. The choice drawn was that of William Hart, who thought the name of his hometown, Buffalo, New York, would fit just fine. 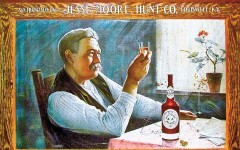 The tale adds to the uniqueness of the town, incorporated in 1884, that today draws 600,000 visitors a year to its various activities and venues. The Jim Gatchell Memorial Museum, housed in the historic 1909 Carnegie Library (above), is Buffalo’s premier historical center. Dedicated to the history of Buffalo and Johnson County, visitors who tour the Gatchell will enjoy detailed exhibits on the local American Indian tribes, the Bozeman Trail and the Johnson County Range War. The latter includes the still-thriving Occidental Hotel, founded in 1880. Guests have included Calamity Jane, Teddy Roosevelt, Buffalo Bill and Owen Wister, author of the ground-breaking Western novel, The Virginian. He spent hours in the hotel saloon studying characters and using what he saw in the book. The lobby alone makes a great stop. It has etched windowpanes, embossed ceilings and antique furnishings. The saloon has a 25-foot bar and 23 bullet holes in the tin ceiling and woodwork. Count ’em and drink up! 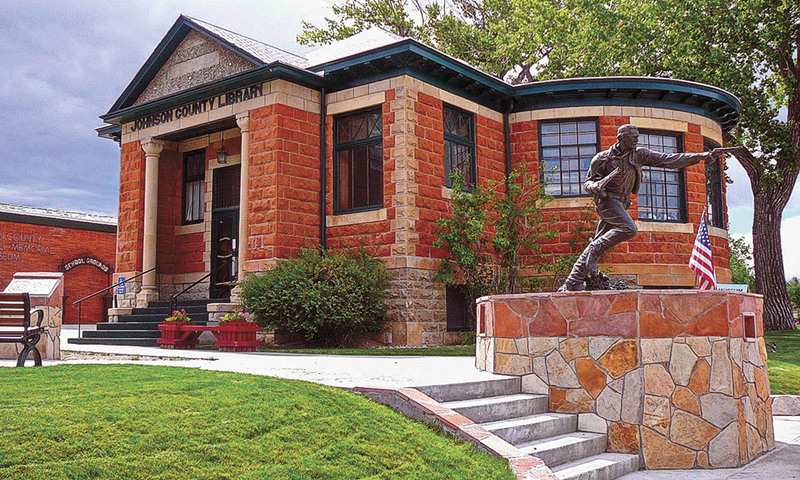 Visitors express surprise at the size and scope of the Jim Gatchell Memorial Museum, which houses 26,000 cultural and historic artifacts from early life in northern Wyoming. Among its items are a striking 1870s-era Indian war shield, painted and decorated with feathers, and a bugle believed to have belonged to Adolph Metzger, a German immigrant killed during the Fetterman fight in December 1866. Local author Craig Johnson’s Longmire book and television series, which are based in Buffalo and Johnson County, inspired the creation of the city of Buffalo’s most popular summer event, Longmire Days. 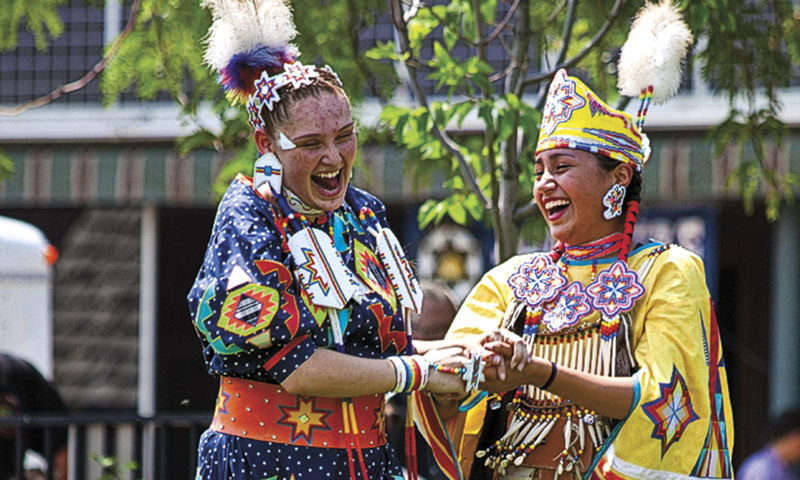 The seventh annual three-day festival, including Native dance demonstrations (below), will be held August 10-12, 2018. Crazy Horse and some 1,000 Sioux, Cheyenne and Arapaho warriors wiped out Capt. William J. Fetterman’s 81-man command in 30 minutes. The Tom Horn exhibit displays Horn’s Marlin .30-30 rifle and scabbard, and his spurs. The famous Indian scout and range detective forgot them when he left town after a stay at the Murray Hill Hotel. 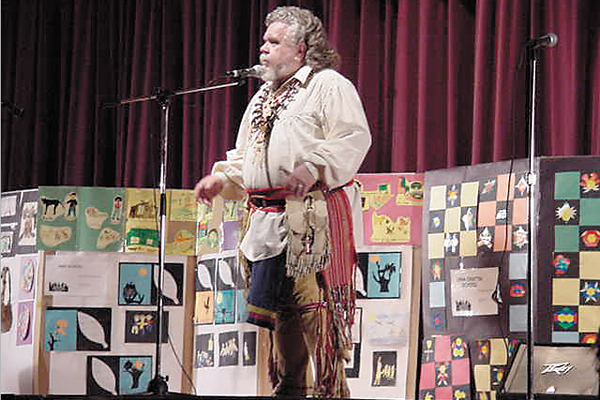 Don’t miss Fort Phil Kearny State Historic Park. The Army fort was established in 1866 to protect travelers along the Bozeman Trail. The interpretive center allows visitors to relive the Indian wars through exhibits and artifacts, as well as a bookstore, gift shop and videos. Three miles away, walk the windswept Fetterman Battlefield while reading interpretive signs telling exactly what happened that bloody day. Buffalo sits beneath the majestic Bighorn Mountains, making it fun for walkers. All of downtown, roughly a block and a half, is on the National Register of Historic Places. Art lovers find much to see at the Hitching Post Gallery, Crazy Woman Fine Art Gallery and In Color Gallery and Design. The building that houses Margo’s Pottery and Fine Crafts dates to 1909. 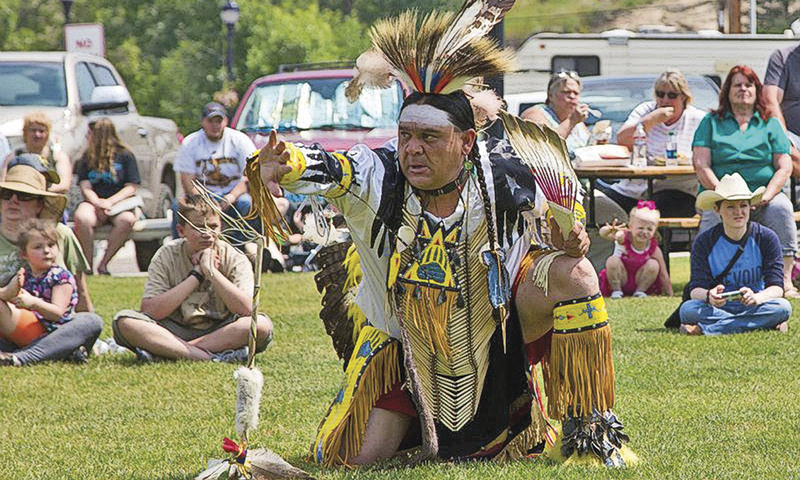 Native dancers will entertain at Longmire Days, August 10-12, 2018. Every Wednesday in June and July, visit ors enjoy the regular rodeo at the county fairgrounds, or the Farmer’s Market in Crazy Woman Square, named for the area’s legendary Crazy Woman Creek and Crazy Woman Canyon. The unusual name is either for a demented Indian woman who lived by the creek, or a white woman who went insane after she witnessed Indians kill her husband. She is depicted in the classic movie, Jeremiah Johnson. Jennifer McCormick, director of marketing and programs at the Buffalo Chamber of Commerce, recommends sampling the elk jerky and the amazing desserts of Maria Domingue. “She’s a wonderful cook and donates all her profits to the troops,” says McCormick. On Thursday nights, don’t miss the bluegrass jam in the Occidental Saloon. Thirteen miles away, stop at the TA Guest Ranch, a pivotal spot in the Johnson County Range War. On the National Register of Historic Places, the 1882 ranch house has 10-foot ceilings and floor-to-ceiling windows, and the barn looks as it did in 1892, when combatants engaged in a three-day shootout there. For an exhilarating backroad drive, head 24 miles west on US Highway 16 to Crazy Woman Road, a gravel path that winds through the canyon. See the flowing creek, wildflowers and majestic cliffs in gorgeous Powder River Country. To plan your trip, visit the Chamber at 55 N. Main St.
Every August, the Gatchell Museum offers eight lantern-lit night tours of Willow Grove Cemetery. Volunteers dressed as characters from Buffalo’s past lead guests to where these “spirits” are buried and deliver first-person narratives about their lives. Beautifully done and loads of fun. On Main Street, the inn makes a great home base for walking around Buffalo. See leaded glass windows and a grand oak staircase. Built in 1903 for $5000, the mansion has been restored to its Western Victorian look. America’s first national monument is a 5,100-foot butte on the prairie. Actor Richard Dreyfus met aliens there in the climactic scene in Close Encounters of the Third Kind. A Crow legend says two Indian girls climbed a rock to escape a bear. To save them, the Great Spirit made the rock grow, forming the tower, and the side grooves were made by the climbing bear. It’s 130 miles east of Buffalo. Use the TA Ranch as headquarters to see the region’s sites. The Little Bighorn Battlefield is 90 minutes away and the Hole-in-the-Wall, a hideout used by Butch Cassidy’s Wild Bunch, 60 minutes away. On ranch grounds, see old teepee rings from Indian encampments. Leo W. Banks is an award-winning writer based in Tucson. He is the author of the mystery novel Double Wide. Wahoo! 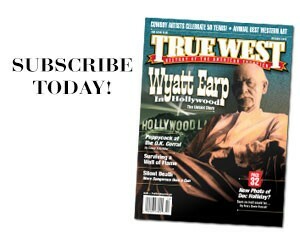 Santa Fe In Each Issue We Profile Some Of The Finest Purveyors Of The Old West. 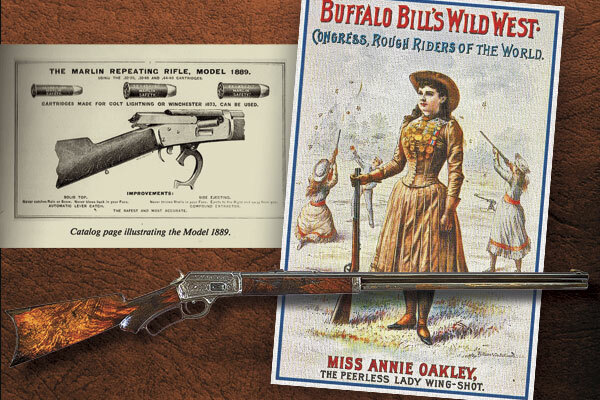 The Marvels of Marlin’s Model ’89 Sharpshooters Annie Oakley and Frank C. Miller were among the rifle’s notable promoters.